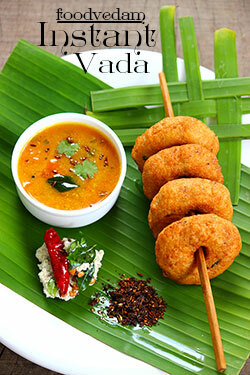 Medu vadas made with instant Vada powder.no hours of soaking and grinding are required. rinse black gram under running water very quickly. don't let them be in the water for more than a minute. put them on a clean, dry fabric and pat dry. keep under sunlight until they are dried out completely. take the black gram into spice grinding jar and make into powder. powder shouldn't be either too fine or too coarse. take a mixing bowl, add black gram powder, salt, baking soda, chopped green chilies, ginger, coriander, onions, curry leaves, cumin seeds and mix well. add water little by little until the batter reaches to a proper consistency.i.e the batter should be neither too runny nor too hard. leave it for 1 to hours.or overnight in extremely cold weather(in the oven with just the light ON). later mix the batter for once and add a little water to adjust the consistency. when the oil is hot, dip your fingers in water, take a small portion of batter, make into flat round shape. make a hole in the middle with your finger and drop into the oil carefully. fry 4-5 vadas in one batch.fry on medium heat until the vadas turn into nice golden brown color. take them onto a paper towel to drain out the excess oil. repeat the process until the batter is finished.